When Chef Tatsuo Takebayashi first greeted us, it was a sight of humble pleasure. A warm smile followed by a bow of humbleness, we were bowled over by the sincerity of Chef Takebayashi. The master chef behind Kappo-style restaurant Takebayashi at the new Ritz-Carlton Residences Kuala Lumpur ushered us gently. One can certainly sense his proudness at the new Takebayashi restaurant. The restaurant is not as huge as most Japanese restaurant but is well-designed to echo a Zen-minimalist Japanese restaurant. A vertical Japanese sushi bar that takes up half the restaurant space for avid diners who loves to catch some chef actions. There are tables set along the bar in parallel against the glass wall to soak in the natural city elements and scene as well. A few chefs are hard at work setting up the evening’s service. However, that didn’t stop them from greeting us with a smile. The catch of the day and fresh produce are displayed on the sushi bar, tempting diners with its glistening and vibrant signs of freshness. From cuts of premium seafood sashimi to an enticing marbled wagyu beef, bright cheery red Japanese Momotaro tomatoes, corn, radish and more, Takebayashi’s menu focuses on such amazing ingredients of Mother Nature. Dinner commenced with Cream Cheese With Miso (RM30). The sheer simplicity of the dish at sight did not do justice to the dish. A brilliant concoction of pairing the lusciousness of cream cheese with the nutty umami note of miso, this appetizer rocks! The cheese is marinated with miso for 3 days before it is being lightly grilled to intensify and married the flavours together. The first bite, the cheese is utterly smoky with a fine divine note of unctuous pleasure. In fact, it is so good, one may literally not want to share this. Cold Tomato Umami Jelly (RM45), another dish that really showcases what fine Japanese produce is all about. The skinned tomato itself literally tasted like a juicy sweet fruit. Set on a bed of konbu-dashi jelly cubes, there is a good balance of fresh juicy sweetness of the tomato with the lightest flavours of savory umami notes from the jelly. The chilled factor of the dish really elevated the vibrancy of the flavours of the dish. If one is ever wondering that the White Fish with XO Salsa (RM80) looked rather familiar, it is because Chef Takebayashi’s previous stint at Nobu inspires his creation for the dish. Depending on the freshest catch of the day, ours was a delectable Kinmedai or golden eye snapper. The delicate firmness of the fish coupled with the sublime notes of house made XO sauce and ponzu sauce is exceptionally delicious! Even Takebayashi’s Chawan Mushi (RM45) is jazzed up with a beautiful brown dried scallop sauce. The silky smooth egg custard has that classic umami note that warmed the palate with pleasure. The chawan mushi is also studded with shrimp, chicken, gingko nut and a yomogi mochi. All in all, the custard is satisfying with plenty of flavour and texture profile. The Salmon Tataki Salad (RM50) is not only beautiful at sight but taste as amazing as it looks. Thick cut lightly seared salmon is paired with Takebayashi’s signature jalapeno sauce with crisp greens and sliced radish. The salmon is utterly sublime with a creamy melt-in-mouth feel and the jalapeno sauce packed enough heat to give the dish its wow factor. A must-order for foodies who loves a good kick of heat! The pièce de résistance of the evening must be the prime cut of fatty Toro and fresh wasabi! 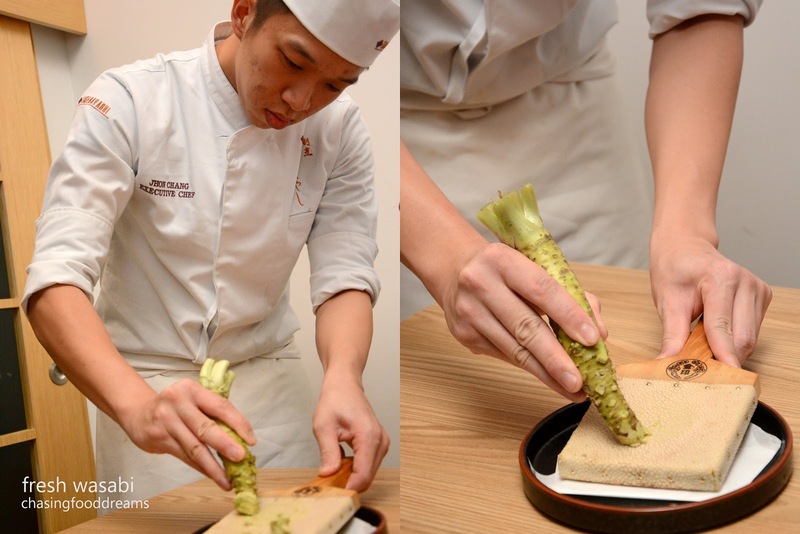 Chef Chang has certainly mastered the art of sushi, having learning from MasterChef Takebayashi. A gorgeous sea green lacquered tray enhanced the skilled-shaped nigiri sushi of Otoro and Aji. Each one generously draped over sushi rice like a plush blanket of ocean pleasures. The sushi is served with chunky pickled baby ginger which lent a delicate gingery tang to clear the palate. Seriously superb, both the Toro (RM40) and Aji (RM10) each are sublime. It is the perfect way to end this gastronomy at Takebayashi.